Although it is not the only or gan necessary for survival—the brain, liver, kidneys (at least one), pancreas, and lungs come to mind–we still regard the heart as most integral to life, most likely because of its central location and role in pumping blood throughout our entire body. As children it was probably the first organ we learned about. That it was possible to press your ear to someone’s chest and hear it encouraged the attraction—bump-bump, bump-bump, or in the medical world, lub-dub, lub-dub—we know it’s beating, without the aid of special instruments. Conversely, assessing the health of other organs requires lab results, scans, or other medical diagnostics. But confirmation of the heart’s function is palpably evident. As heart transplants become more common, our most familiar organ may lose some of its status; indeed, in cardiac units around the country, many patients today are being discharged not only with a donor heart, but increasingly, a completely artificial, mechanical heart. The completion of one entire circuit, meaning that the blood travels from the heart through the arteries, out to all tissues and organs, and then returns to the heart via the veins, takes about one minute. There is no area in the body for blood to be stored—it is constantly moving. So in one completed circuit, all 5.5 liters of blood is pumped through the entire body, in one minute. Impressive, right? The heart is not lazy. Blood travels to organs and tissues primarily to keep them oxygenated. Without that key element our organs would stop working. O2 is required to by every cell in the body to complete specific functions, depending on the type and location of the cell. Our cells are like us, but smaller. They make things, require certain nutrients, and create waste. All that activity keeps our metabolism going–it is our metabolism. A byproduct of that activity—the waste–is CO2. CO2 is transported in the blood from the tissues and organs, via the veins, back to the heart, and then to the lungs, where you exhale it out of your body. More on that in circulation, which is fascinating and happens 24/7 without us ever thinking about it. The heart has four chambers: two halves, with two chambers each—an atrium—some call it an auricle—and a ventricle. 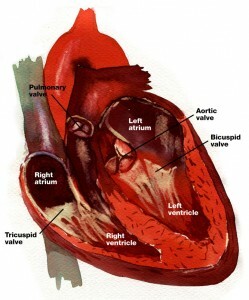 Each atria and ventricle pair pump blood to a different part of the body. The right half supplies the lungs with blood (via the pulmonary circuit), and the left half supplies the entire body and brain with blood (the systemic circuit). Because the left ventricle pumps blood to a much larger area than the right, it is larger and much more muscular than the right ventricle. It’s important for the blood to move in one direction through the heart–for it not to backup–and this is controlled by valves. There are four of them: one between each atria and ventricle pair and another leading out to either the pulmonary or systemic circuit. Blood fills the atria first (both left and right atria fill at the same time), pressure builds, the atria contract, and the bicuspid and tricuspid valves open. The first sound—the lub—is the sound of the bicuspid and tricuspid valves closing. Blood then fills the ventricles, pressure builds, the pulmonary and aortic valves open and blood moves out of the heart into the pulmonary and systemic circuits. The second sound—the dub—is the sound of those valves closing. And the entire process starts over from the beginning. The heart contracts about 80 times a minutes for our entire lives. An electrical impulse, conducted by nerve cells, or neurons, is what keeps our hearts pumping continuously throughout our lives. I’m working on a post on the nervous system next, but a quick intro is necessary when talking about the heart. Electrical impulses or signals are carried throughout the body by the nervous system. The nervous system is mostly communicating with muscle and endocrine (hormones) cells. The heart is constructed of muscular tissue and also covered in a web of neurons. This is significant because in addition to the neural communication occurring with the individual muscle cells of the heart–the myocytes–the neurons surrounding the heart muscle are providing a separate set of instructions. These nerve fibers converge at a few key places in the heart, into nodes. The SA node, short for sinoatrial node, is also called the pacemaker, because it is where the electrical stimulus in the heart ori ginates, and it sets the pace for the electrical impulse as it travels to several other nodes and bundles of conducting fibers. It sets the pace for the heartbeat and can be sped up by the nervous systems if we experience a surge of epinephrine and the fight or flight urge. An ECG is measuring the electrical activity of the heart and can indicate damage to the SA node and the accompanying nodes and conducting neurons. This electrical pulse originates the contraction of the cardiac muscle; as long as the SA node is intact, the heart will continue to contract, or beat, even if lifted from its protective space in the thoracic cavity. It is timed specifically to contract the atria first (remember the atria fill with blood first, then the ventricles), then pause so that the atria have time to empty completely before the electrical pulse moves to the AV node, which controls contraction of the ventricles. 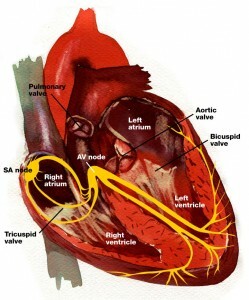 Not having a pacemaker, the AV node relies on the SA node–the pacemaker–to set the heart rate. Although surgical implants of a pacemaker is high on the list of unnecessary surgeries, if it’s truly needed it’s a lifesaver. Most neurons need a stimulus to send a signal, or “fire”. Interestingly, the SA node will fire action potentials in the absence of any stimuli. These spontaneously active cells have a precise balance of voltage-activated ion channels that allow the cells to fire without a stimulus. Blood pressure—high BP causes excessive stretching of arteries, which causes scarring, then plaque build-up, then narrowing, then arteriosclerosis—not a good trajectory! So that’s the heart! I’d love it it you had questions, or if you’re also a nursing student, I’d love to hear what path you’re taking and where you are in your studies.